2012 Ford Focus ST from 21,995 | What Car? 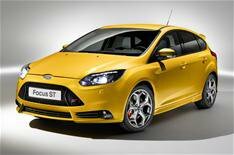 The new Ford Focus ST will cost from 21,995 when it goes on sale next month. The Focus ST Estate is priced from 23,095. Both versions are powered by a 247bhp, 2.0-litre turbocharged four-cylinder engine mated to a six-speed gearbox. The Focus ST emits 169g/km of carbon dioxide and averages 39.2mpg. Ford has made changes to the Focus's suspension, steering and brakes for the ST, and the central exhaust, front grille and the Tangerine Scream paint option has been kept from the concept car revealed at the 2011 Frankfurt motor show. There will be three trim options: ST-1, ST-2 and ST-3. ST-1 comes with cloth Recaro seats, keyless start, 18-inch alloy wheels, DAB radio and Bluetooth. The Focus ST-2 costs from 23,495 and gets part-leather Recaro seats, dual-zone climate control, Quickclear heated windscreen, ST floor mats, automatic lights and wipers, and an auto-dimming rear-view mirror. The top-spec Focus ST-3 costs from 25,495 and gets electrically adjustable heated leather Recaro seats, keyless entry and bi-xenon headlamps. Three option packs are available for ST-2 and ST-3 versions. Active City Stop, Blind-Spot Monitoring, Lane Keeping Aid and Lane Departure Warning. Rear parking sensors, electrically folding door mirrors. 18-inch alloys in rado-grey, red brake calipers and illuminated scuff plates. The Focus ST looks to be keenly price when compared with the five-door VW Golf GTI, which costs 25,915. Customer deliveries start from September.